Sailor Jerry is a straight-up, no-nonsense rum. We craft the spirit from a selection of rums distilled in the Caribbean. Our master blenders “marry” the rums to our exacting recipe, then infuse it with our one-of-kind mix of spices and other natural flavours, most notably vanilla and a touch of cinnamon. The result is high-quality, old-school spiced rum. An enduring classic, not a fly-by-night fancy. 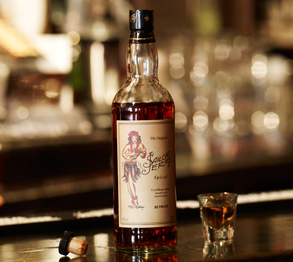 Smoothness is the key to Sailor Jerry’s versatility. Enjoy it how you like it — straight, mixed or in a cocktail. They started it as a small mom and pop clothing brand in Philadelphia, collaborating with local artists to make leather goods, sneakers, t-shirts and other products featuring Sailor Jerry’s flash. Since Sailor Jerry spent half his life as a sailor (and the other half tattooing sailors) it was a natural move to create a spiced rum in his name. A cult started to grow around the rum, and pretty soon, it started to outsell anything else they made. Rum has been intertwined with Caribbean culture for nearly 400 years, coming into existence alongside the sugar industry. The 1600s were the coming-out century for rum. Quality grew by leaps and bounds and so did people’s taste for it. By 1789, a hogshead of the finest Caribbean rum was chosen as fit for the first presidential inauguration of an upstart nation called the United States of America. Today’s Caribbean rum distillers have well over 200 years of experience perfecting the art of distillation, aging and blending. Adding spices to rum is an old sailor’s tradition. Those first rums were crude and harsh, so seamen would blend and mix in any spices they had on hand to improve the rum’s flavour. Today the harshness is no more, but the art of spicing rum is alive and well. You are currently reading The Rum | Sailor Jerry at Naik Vinay.